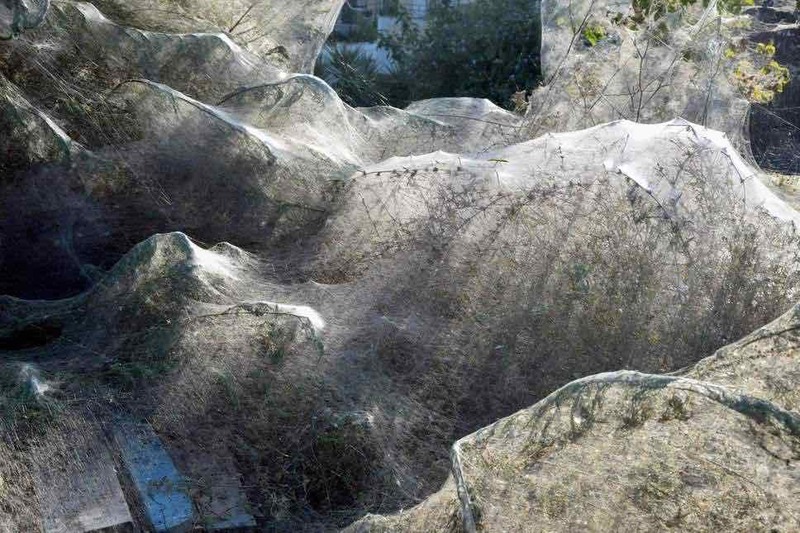 Giant spider web stretches 300m along Greek coastline as spiders have ‘party’ weaving eery silver nests. Spiders have spun a giant network of webs across a 300m (1000ft) stretch of Greek coastline in unusually warm weather. Photographs captured the eery silver structures draped over vast patches of greenery. Conditions such as humidity, high temperatures and an increase in the mosquito population combined to provide ideal conditions for Tetragnatha spiders to weave the huge blanket in Aitoliko, 160 miles (250km) west of Athens. Experts say the webs are a seasonal phenomenon, and provide large nests for the spiders to mate. Maria Chatzaki, professor of molecular biology and genetics at Democritus University of Thrace, Greece, said it was as if the spiders were having a “party”. She told Newsit.gr: “They mate, they reproduce and provide a whole new generation. “These spiders are not dangerous for humans and will not cause any damage to the area’s flora.